government agency that placed it. Imagine a federal wildlife agency setting deadly "instant-kill" traps within 45 feet of your suburban back yard where your children play. Imagine that one of those government-set traps kills your beloved dog and no one returns for the trap, or to even say they're sorry. This sounds like the kind of government abuse and secrecy one would see exposed on "60 Minutes," and it should be. However, that is not the case in Gresham, Oregon, a suburb of Portland, where the government has made every effort to intentionally hide such a tragedy. The agency responsible? Wildlife Services, a division of the U.S. Department of Agriculture, Animal, Plant, and Health Inspection Services. Please read Maggie's story below, watch the video interview with the McCurtain/Kavanagh family, and email "60 Minutes," your favorite news show, or your local media today. Give them a link to this story and ask them to do an investigative expose on this case and the USDA's barbaric, wasteful and indiscriminate Wildlife Services program. If you can help us spread the word by making a financial contribution, donate today. 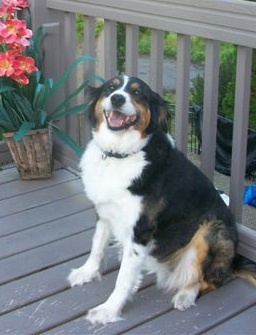 Maggie, the McCurtain/Kavanagh family's black, brown and white border collie, was only seven years old on August 27, 2011, the morning she died just a few feet from her fenced-in back yard. It was an unusually warm morning, which made her routine visit outdoors that much more inviting, and the scents outside that much stronger. For reasons unknown, the backyard gate was open that morning. Within minutes of stepping outside, Maggie—who loved to swim and camp with the family and play fetch with Squeaks the kitten—would have her neck broken and windpipe crushed. About 9 a.m. Denise Kavanagh heard frantic knocking at her door. A neighbor asked if the family had a black and white dog. She said she’d seen one by the water but it wasn’t moving. The dog was Maggie. She was immobile because her head was caught in the vice grip of a Conibear "instant-kill" trap. She was still breathing, her eyes flashing in fear and pain from the more than 90 pounds of pressure that slammed the trap's jaws shut around her neck when she stuck her nose in to sniff the bait. No one knew how to get the trap off Maggie. There were no instructions on the device, no numbers to call, no signs with any useful information posted in the area. After minutes that felt like hours, Maggie’s family and neighbors located pliers and screwdrivers and were able to move the trap’s springs enough to get her head out. But it was too late. Maggie's violent struggle was over. She lapsed into shock and gave in to death. How do you wake your children and tell them their best friend and faithful companion is dead? After hearing the shocking news, the children— overcome with grief—kissed, petted, and hugged the lifeless body of their beloved friend in a final farewell and watched from the windows as their father Doug took her lifeless body to the veterinarian to be examined. Within these few hours the world was permanently altered for the McCurtain/Kavanagh family. The fenced-in yard had always felt like a safe zone for Maggie and the kids. But when the unimaginable happened just a few feet away, those feelings of safety disappeared. The deadly Conibear trap was set just 45 feet from their back yard in a common area where children play, feed ducks, look for frogs, and retrieve escaped soccer balls. The trap was set to kill Nutria, aquatic rodents which are considered pests. A homeowners' association email had notified neighbors that these traps would be placed along Cedar Lake, with instructions not to disturb them, but included no information as to the type of traps being used, nor any warning of danger they posed to pets or people, and no information on how to remove/open the traps. The result: a beloved pet struggling and dying in agony; her family and neighbors traumatized and hysterical, trying desperately to help. The Conibear trap was concealed and set in front of a live box trap. Children had been playing in the area, unaware that the deadly devices were there, camouflaged with leaves and grass. Posted nearby was a single sign, a 3-inch circle, stapled to a short wooden stake, indicating that the traps were federal property, and tampering or removing was a federal offense. There was no warning/danger alert about what the traps actually do. There was no information about how to remove the trap, no license or permit information. Nothing about what to do or who to call if the worst happened, if a child or pet were caught. Nothing. At least two traps were in place by 5:30 that morning, Maggie was dead by 9 a.m. 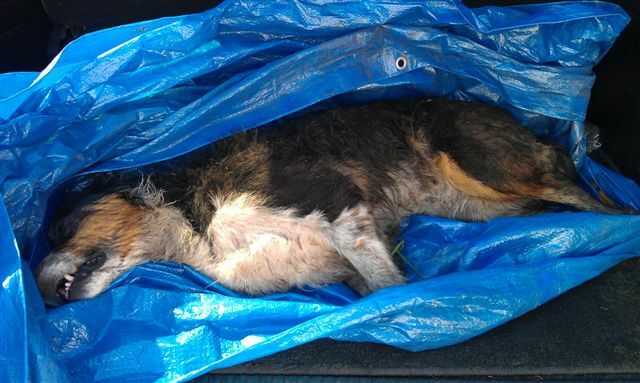 Within a few hours of her death, the trap that killed Maggie along with the live box traps, were gone. The McCurtain/Kavanagh family found another kill trap behind their house a couple of days later. 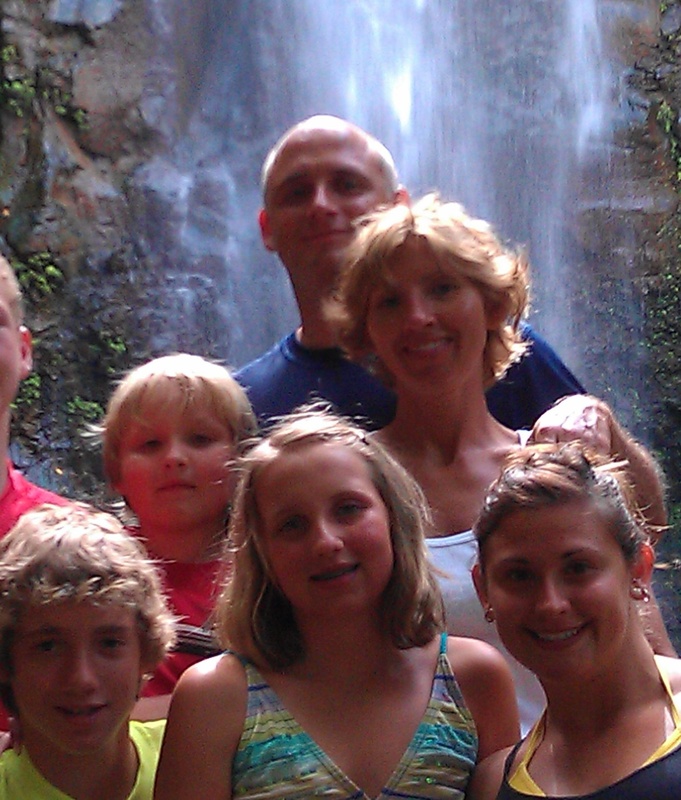 Where Could the Family Turn for Help? Although Denise was without guidance and had no idea how to get help, she kept a detailed record of what she was told and by whom. She took photographs of the yard and of the traps. She contacted the Oregon Department of Fish and Wildlife (ODFW), who referred her to the Oregon State Police. A state trooper came to the McCurtain/Kavanagh’s home and took a statement. After waiting a reasonable period of time, the trooper contacted them again. Neither Doug nor Denise was happy with his response. When Denise asked him why such dangerous traps were used in the first place, she was told that the government-paid Wildlife Services trapper was impatient and wanted to speed up the process. While she had the department’s sympathies, she was told that the trapper had done nothing criminal (neglectful maybe), but there was nothing the authorities could do. The empathetic trooper suggested they contact an attorney. with her new toy, "Baby." While it is difficult to get public records from state and federal agencies, this is especially true regarding Wildlife Services. The Freedom of Information Act (FOIA) is designed to force federal government agencies to fully or partially disclose government documents. However, the FOIA process is daunting—even for experienced organizations like Predator Defense—and for individuals it can be overwhelming. Those who chose to file a federal torte claim for compensation are limited to the value of property lost, including pets (pets are considered property, not persons). The amount of the claim for most pets is relatively small and a person could spend thousands on an attorney trying to get compensation. The emotional loss is impossible to measure. Furthermore, fear of retaliation from Wildlife Services trappers is real. In many cases, people simply give up because constantly revisiting the trauma of the loss of their beloved pet is too intense and because the specter and expense of taking on the federal government is too frightening. It took the McCurtain/Kavanagh family six weeks just to find us at Predator Defense. We filed a FOIA request on their behalf and arranged for an attorney to represent them. As of this writing (November 2011), Denise has not heard so much as an expression of sympathy from the homeowners' association or from Wildlife Services. Please watch the video interview with the McCurtain/Kavanagh family and take a minute to email "60 Minutes," your favorite news show, or your local media. Give them a link to this story and ask them to do an investigative expose on this case and the USDA's barbaric, wasteful and indiscriminate Wildlife Services program. If you can help us spread the word by making a financial contribution, donate today. likely killed by Wildlife Services traps and poisons. Photo courtesy of Project Coyote. The Conibear "instant-kill" trap kills by breaking the neck and strangling the victim. The one that killed Maggie had a 9” jaw spread; a trap of this size is almost impossible to open by hand. Conibear traps are square, with two rotating jaws, the larger version (the one Maggie died in) has two springs. You can see an animal-eye view of the Conibear trap by watching this video. Conibear traps are used to capture and instantly kill species—such as badger, beaver, bobcat, coyote, fisher, lynx, nutria, otter, and raccoon—but they are indiscriminate. This means that pets, endangered species, and other non-target animals, such as Maggie, step into their jaws. According to the manufacturer’s website, Oneidavictor.com, these traps “should NOT, however, be used where non-target animals are at risk for capture” (original text in bold). The traps are strong enough to maim, injure, and kill a child. "…all traps and snares, whether set for furbearing or unprotected mammals, must be legibly marked or branded with the owner’s license number that has been assigned by the Oregon Department of Fish and Wildlife; except that unmarked traps or snares may be set for unprotected non-game mammals by any person upon land that they lawfully own. It is unlawful for any person to trap for furbearers, predatory animals, and/or unprotected mammals using…any instant kill trap having a jaw spread of 9 inches or more in any land set." The USDA Wildlife Services (Wildlife Services) Directive 2.210 states that “the use of all traps, snares, and other animal capture devices by Wildlife Services employees will comply with applicable Federal, State and local laws and regulations related to animal capture for managing wildlife damage” (Wildlife Services Directives). Wildlife Services claims they are careful to observe these laws. This was not true in Maggie’s case. The trap that killed Maggie was 9 inches and was set in the Homeowners’ Association common area, a clear violation of Oregon’s trapping regulations. These types of tragedies are not limited to Oregon, as people have been injured and pets killed in other states (see Ban lethal M-44 sodium cyanide devices). 1. That all traps be labeled. There were no labels on the traps used in this case. 2. That warning signs be posted on main entrances or commonly used access points to the area where traps are set. No such warning signs were posted in this case. 3. That conibear traps greater than 8 inches be restricted to water sets. Maggie was caught in a 9 inch conibear land set. For more information on Wildlife Services, visit USDA War on Wildlife. Please watch the video interview with the McCurtains and take a minute to email "60 Minutes," your favorite news show, or your local media. Give them a link to this story and ask them to do an investigative expose on this case and the USDA's barbaric, wasteful and indiscriminate Wildlife Services program. If you can help us spread the word by making a financial contribution, donate today. USDA Wildlife Services (Wildlife Services) is an agency that operates under the radar of most people, including politicians. The name functions as a smoke screen for the agency's actual role and function. Wildlife Services does not provide services for wildlife, instead it serves those with an interest in killing animals by trapping, poisoning, bludgeoning, shooting, and denning (killing pups in their natal dens, often using a fumigant or gasoline and setting them on fire). Read more at USDA War on Wildlife. Wildlife Services spends approximately $126 million tax dollars each year killing wildlife—largely at the behest of special interests such as livestock and hunting organizations—including over 115,000 predators (FY 2010), such as coyotes, wolves, cougars bears, and bobcats, just to name a few. Nationally, Wildlife Services reports killing approximately 500 dogs and 1,325 cats in 2010, but claims these animals are unowned and feral. Predator Defense believes the number of pets killed by Wildlife Services is grossly under-reported (see USDA War on Wildlife Kill Data). Former Wildlife Services trappers have told Predator Defense that when they trap a dog and are certain no one witnessed it, they routinely remove the dog’s collar and dispose of the body where no one will discover it. It is likely that hundreds, if not thousands, of pet dogs and cats presumed missing by their owners are in fact killed by Wildlife Services traps, snares, and poisons— especially in the American west. Predator Defense works 365 days a year to expose and eliminate the USDA Wildlife Services lethal predator control program. Wildlife Services not only wastes millions of taxpayer dollars, but also harms the environment by removing predators that are critical to a healthy ecosystem (see OSU Ripple research). As Maggie’s case demonstrates, their methods are brutal and barbaric, and pose a threat to endangered species, pets, and humans. "A Long Wait in a Trap"
"Did Princess Have to Die?" "Wildlife Services' Scare Tactics in Urban and Suburban Portland"
You can also help us expand our efforts to save native predators and stop illegal hunting, trapping, and extensive predator-killing programs by donating to Predator Defense.